On April Fools Day I received an email notifying me that I was one of 14 finalists for the National Institute for Health Care Management (NIHCM) Foundation's Digital Media Award for my work exposing the financial practices of the American Board of Internal Medicine (ABIM) and its Foundation on this blog. Hard to believe, really. Especially when I looked at the other individuals who were also selected as finalists, many of whom are veteran and highly decorated digital health care media journalists who do amazing work day in and day out. If you have a few minutes, be sure to read (or watch) each of the works nominated for this award. I can recall my reluctance to publish this work. The prospect of publicly labeling a national accreditation organization responsible for "certifying" one quarter of US physicians as potentially corrupt was risky. I ran the piece by other trusted colleagues before publishing who gave me phenomenal edits and suggestions. I had several lawyer friends review the piece as well. After all, I am not a person who enjoys criticizing others or exposing my family to legal risks. I also knew that there was a better-than-even chance that some senior leadership at my institution would not be pleased with the report. Celebrated syndicated columnist David Brooks once noted that there are things we do as "resumé builders" and other things we do as "eulogy builders." Writing in medical journals builds resumés. Sadly, writing on a blog does not. While I have no doubt that winning the grand prize for this Digital Media Award would have been quite a "resumé builder" for a second chapter after medicine, that was never my motivation for this work. As a working physicians who has now endured the increasingly onerous ABMS Maintenance of Certification® (MOC®) process three times, I have seen it morph from a personal marketing tool to a mandatory and ridiculously onerous biannual money stream for a group of unknown non-clinical physicians hiding behind the thin veil of non-profit leadership hubris and avarice. Then, seeing my residents and fellows shell out large sums of money to pre-register for for MOC® before they were allowed to register for their initial certification added more concerns. Finally, the long history of money transfers between the ABIM and its Foundation, the highly conflicted evidence base with shoddy or colluding peer review that the ABIM promotes, and the subspecialty organization political funding machine that occurs as a result, led me to conclude that MOC® was always been about the money, nothing more. So thanks to the NIHCM. Thanks to everyone who have supported me and given guidance in this endeavor. (You know who you are.) Thanks (especially) to Charles Cutler, MD whose independent yet highly professional 28-minute critique of the ABIM helped blaze the way for my essay's publication. It will be interesting to see where this all goes. The American College of Cardiology (ACC) leadership, troubled by the "complex situation" presented by the changes in re-certification by the American Board of Internal Medicine (ABIM), issued an "urgent message" yesterday on their blog. This message hinted at the ACC's pathway forward: to create a "second task force" to "aggressively" explore "whether an alternative board should/could be developed by ACC for our members." They then add a cautionary note, stating "while working as rapidly as possible, we want to be cautious, realizing the great complexity of the situation." So what are cardiologists and cardiac electrophysiologists to think of this latest "urgent message?" It is clear that the ABIM's MOC program as it exists can no longer be considered legitimate. However, the ripple effects of the scandal of the ABIM and its Foundation are so far reaching that every single member board of the American Board of Medical Specialties' MOC constructs' twenty-four member boards will open themselves to scrutiny once the financial genie leaves the bottle. It is not easy to unravel a monopoly when it's found to be (1) scientifically unfounded, (2) corrupt, and (3) profitable to the many leaders of these unaccountable non-profit organizations' leadership. The era of the gilded age of non-profit organizations controlling medicine is coming to an end and every one of the scientific non-profit organizations that have hid behind their secretive walls for so long know it. That's why this message was so "urgent." It was quite a week for America's practicing physicians. For months the frustration over the lack of accountability of the American Board of Internal Medicine (ABIM) and the American Board of Medical Specialties Maintenance of Certification (MOC) program had been building. Even anger, an emotion few physicians have time for, was mounting. Physicians stopped working for a moment and picked up the phone. For many, it was the first time they had ever called a Senator's office. For others, the first time they had written one. @doctorwes @DrSethdb Calling my senators was remarkably easy and took less than five minutes. I encourage others to call. @doctorwes @kevinmd @lg44715502 Message delivered to @SenJohnMcCain and @JeffFlake - MOC not about better patient care shouldn't be in HR2! I called @SenGillibrand & @SenSchumer! RT @doctorwes Working Doctors, Call Your Senator TODAY http://t.co/6mgTE1bE0I Where's the petition? For US Senators in Washington DC (or their staffers), it was also the first time they had heard from front line working physicians rather than physician-lobbyists knocking on their door. Weren't working physicians supposed to just be "excellent sheep?" But there they were: a pediatrician calling over her lunch hour, a family practice doctor taking a few moments between patients, or a cardiac electrophysiologist ("What's that?" they asked) reading EKGs and calling. It was almost as if you could hear them asking, "Why are these doctors calling? What do you mean there's an anti-trust suit pending? I thought they wanted this SGR Reform! What is this MOC thing anyway?" Last night we had a group meeting of some forty cardiologists in our practice. Everyone listened politely to the administration explaining their new initiatives, new plans for growth, things we could do better, how the SGR Reform Bill, HR2, had passed. Doctors listen politely. But there was a buzz in the air. Younger doctors were questioning if MOC was still part of the bill. They were questioning the regulatory establishment, wondering if they should join the American College of Cardiology if they supported the passage of HR2 that included MOC. Questioning. Reenergized. Hopeful. Practicing doctors might not have won the battle to stop the ABMS Maintenance of Certification program from being incorporated into our new health care law, or for parts of the program being used as a medical registry for physician reporting purposes in H.R. 2. But the other night they won something much better: they learned that they weren't powerless. They remembered that being "accountable" for peoples' lives is very different than being "accountable" for dollars. Thanks to all who raised a voice, wrote a letter, and took a stand against MOC. I can't tell you how great it was to see so many physician nationwide come together so quickly to stake a stand on this remarkably divisive and corrupt program that extends, like a hydra, throughout our entire health care system. We have have good reason to smile. Congress and the public now know about it too. Well, well, well, this little blog got a mention in the New York Times Well health care blog last evening in a post entitled "Board Certification and Fees Anger Doctors" by Joshua Krisch. Too bad what really upsets doctors is not certification, but the proprietary RE-certification monopoly known as the ABMS "Maintenance of Certification" (MOC) program. At least the post includes a dashing public relations photo of Richard Baron, MD, the president and CEO of the American Board of Internal Medicine (ABIM) sporting a neatly-pressed casual sport coat with a hipster purple shirt while he appears to be earnestly conversing with a "board service" representative. While the article fairly disclosed some of the issues that bothers physicians, it was remarkably devoid of what really irks physicians, especially the egregious and corrupt financial transactions of the ABIM uncovered on this blog in December 2014. Follow-up investigations have found that the ABIM repeatedly funneled $30.6 million to their separate non-profit, the ABIM Foundation that is lead by the same officers between 1998 and 2007. It appeared this transfer of "grants" was used to supplement an investment portfolio that had already exceeding $55 million and included a $2.3 million condominium complete with a chauffeur-driven Mercedes S-class town car, and leadership conferences at 5-star hotels. All while the ABIM was bleeding cash and growing a deficit from negative $10 million to negative $43 million. More recently, even more concerning allegations regarding the ABIM's financial and tax disclosures were revealed by veteran journalist, Kurt Eichenwald of Newsweek. So it goes without saying that I was disappointed that Mr. Krisch failed to mention or investigate any of these financial dealings of the ABIM in his reporting. Clearly, it appears journalists need Maintenance of Journalism Certification, too. You see, the public demands such certification. After all, an Institute of Journalism Report published in 1999 showed that journalism errors contribute to 999,000 over-treatments and approximately 5000 deaths each year. Beyond quality, subscribers need to be assured they're getting "value" from their costly annual New York Times subscription. Fortunately, a new American Board of Journalism Specialties (ABJS) exists to assure quality journalism that not only meets, but exceeds, societal standards. The ABJS has assembled a whole host of subspecialty member boards with salaries commensurate with the medical subspecialty board executives to establish credentials for each category of US journalism. These include the American Board of Health Care Journalism (ABHCJ), the American Board of Finance Journalism (ABFJ), The American Board of Business Journalism (ABBJ), the American Board of Entertainment Journalism (ABEJ) , the American Board of Sports Section Journalism (ABSSJ), and the American Board of Weather Reporting Journalism (ABWRJ) and the American Board of Style Journalism (ABSJ). Each member board nominate speciality advisors who provide content for the once-every-ten-year high-stakes secure examination that assures quality reporting in each journalism category. Literature supporting the benefits for Maintenance of Journalism Certification is second to none. While the costs are different for each category of journalism, they harmonize well with prices set by the American Board of Internal Medicine's MOC program. Furthermore, the examination occurs in industry-standard computerized Pearson Vue Testing Centers that promise comfort and security with the finest of palm reads and cavity searches prior to testing. Our most recent Maintenance of Journalism Certification (MOJC) results shows that only 78% of journalists pass the ABJS's recertification test on their first try, demonstrating the rigorous nature of the testing. Don't worry, though, 96% of journalists ultimately pass their examination. Journalists who fail just have to attend a Board Review course developed by their respective ABJS member board to assure they are fed the correct answers for a just a few thousand dollars more. Once completed, repeat testing fees are kept at a reasonable $750. And for those who fail? Well, we're really not sure what happens to them. The secure exam tests mastery of mathematics through calculus, statistics, English Literature, and Written Composition. Strunck and White's "Elements of Style" are extensively utilized to assure the highest of testing standards. Journalists undergoing this mandatory evaluation every ten years can rest assured that each of the secure examination questions have been carefully vetted using psychometric testing techniques. Because of the time, energy, and golf games missed to create these questions, paired with the need to maintain the utmost secrecy in fairness to all, divulging test questions to other journalists is strictly forbidden. In the event of such a breach, the ANJS will have no choice but to use every legal means to punish the journalist, resulting in suspension or revocation of the journalist's writing credentials and ability to practice their trade. Freedom of the press in such a circumstance means nothing. With the explosion of online content of varying quality, the public has demanded that continuous learning take place. Beginning in January, 2014, a new, even more rigorous continuous certification process has been developed that incorporates Practice Improvement Modules (PIM) in addition to the secure examination. With this program, journalist will have the option to "pay-as-you go" every two years or cough up the full re-certification fee up front to assure they will be listed on CertificationMatters.org as "Meeting Journalism Standards." PIM will require that journalists participate in survey collection of colleagues' assessment of their workplace and worth to society. Questions concerning quality of their fax machine, computer power, and diversity of reporting to avoid racial, gender, or age bias will be included. Survey results are transmitted non-securely to the ABJS website so the information can then be purchased by concerned stakeholders like ABC, CBS, NBC, CNN, HBO, Huffington Post, Style Magazine, Cosmopolitan, the New York Times, and the Leapfrog Journalism group to censor stories that might not meet journalistic professionalism standards. In addition, a portion of journalist's testing fees will help fund the Choosing Wisely Investment Club that has been looking for a really nice condominium in SoHo. Finally, such a journalism certification process will harmonize nicely with the unproven ABMS Maintenance of Certification program that is slated to be incorporated as a medical registry in the Medicare SGR Repeal Bill, H.R. 2. Same concept. Same money. All for the "public good." Now you know why doctors are angry. 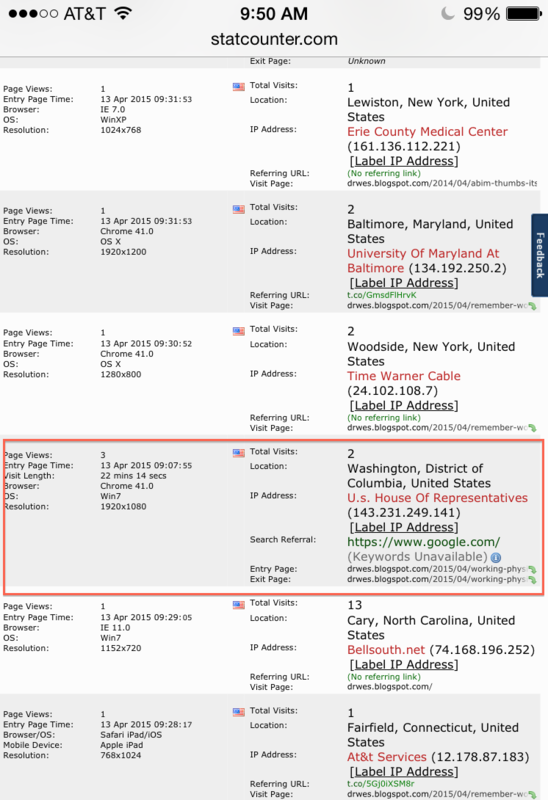 First, look up your Senators' names, entering your zip code here. Be SURE to call the Capitol switchboard at (202) 224-3121 and ask to be connected to each senator's office. Remind them that you are an actual WORKING physician, not one who pretends to represent physicians on Capitol Hill. Remind them that they are about to sign a piece of legislation that allows a group of 25 independent nonprofit organizations to monopolize the requirement that you pay nearly $1000 per year (between their fees, travel, time away from work, and lost revenue, per Dr. Charles Culter's video explanation 2 Dec 2015) to maintain your ability to practice your trade if they sign H.R.2 into law. Remind them NO OTHER PROFESSION has such a requirement to maintain their credentials to practice their trade. Remind them that there is NO INDEPENDENT PROOF that the American Board of Medical Specialties MOC® registry has EVER been proven to improve patient care. Remind them that the American Board of Medical Specialties NEVER disclosed the fact that they are being sued in Federal Court for possible anti-trust violations while lobbying Congress and THE SUIT IS STILL PENDING. Remind them that the American Board of Internal Medicine (ABIM), the largest non-profit of the group of non-profits, grew its debt to $43 million in losses and offset those losses by auditing gimmickry called DEFERRED REVENUE to the tune of $76 million, which gives the appearance that the MOC medical registry contained in H.R. is being used for cover. Tell them that the both the ABMS and ABIM appear in your view to have committed tax fraud because they have reported on their Form 990's to have not lobbied Congress, when, in fact, they have. TELL THEM THEIR BILL MUST BE AMENDED BEFORE IT CAN BE PASSED to remove the MOC Medical registry as a "value" registry for inclusion in H.R. 2. No one else will do this for you. Played so badly it would make Goodfellas blush. ABIM clearly got it wrong. We launched programs that weren't ready and we didn't deliver an MOC program that physicians found meaningful. We want to change that. …"
Doctors thought this was because of the malfeasance that was discovered in the ABIM's dealings with purchasing $2.3 million condominium's with chauffeur-driven Mercedes S call town cars and systematically funneling $30.6 million of our testing fees to an obscure Foundation that markets some version of social justice "professionalism." The plan all along was to shift gears and make MOC integral to how Congress would permit the Center for Medicare and Medicaid Services Congress to calculate your "value" as a worker to the health care system. Just do your practice improvement modules and walk backwards and type of a keyboard so they can get paid. Yes, Virginia, MOC wasn't ready because MOC wasn't part of the "Doc Fix" legislation (H.R. 2) yet, but now it is. 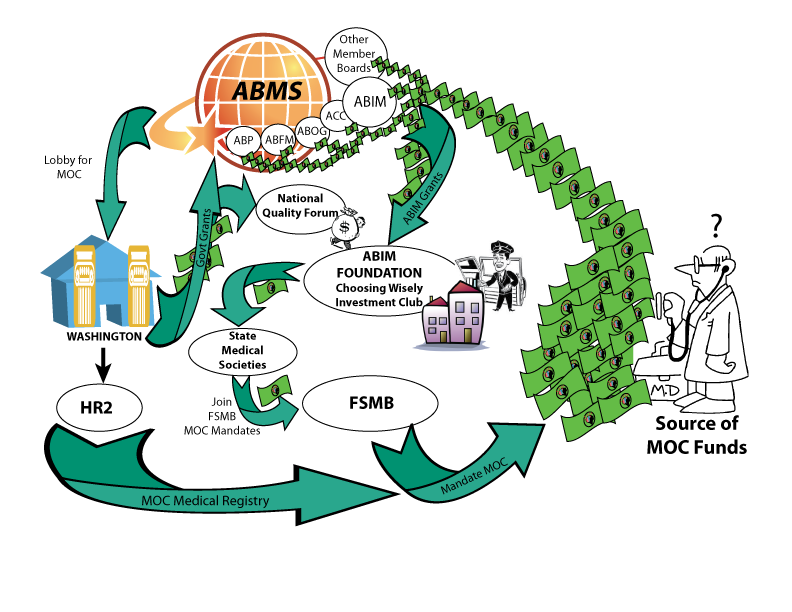 We recommend that ABMS MOC® serve as a reporting pathway in the future for more detailed data on performance across the competencies. Making it possible to report through MOC will reduce administrative burden on physicians participating in voluntary professional development activities, will help to assure that there are practice-relevant options for all specialties and that quality measurement will be tied to a disciplined improvement process. On Monday before you start work, contact your state Senators by calling the US Capitol switchboard at 1-202-224-3121. Don't hang up until you speak with your senator or their aide. Tell them you have patients waiting. Tell them you're being held up from a meeting. But get through and don't hang up until you do. The switchboard is open 24-hours a day, but call in the morning, 8 AM EST if you can, to be sure your voice is heard. But get through. Tell them you want all references to Section 1848 (k)(4) used as determinants of of a "value-based modifier" struck from the bill (Addendum: this is the section that authorizes the ABMS to use their MOC program - see comments below). Tell your Senator that if he or she can't do that, then they should vote "NO" because you'll have to pay hundreds of dollars representatives of the independent ABMS member boards every two years to practice medicine and take time away from patients to do meaningless and unproven busywork. The ABMS MOC® program should NOT be allowed to stand in the new SGR repeal legislation (H.R.2) in any form. Tell them that such a scheme represents taxation without representation. It is time to send the message LOUD and CLEAR that doctors will not participate in a pay-to-play scheme with the ABMS, ABIM or any other member board every two years to practice our trade. 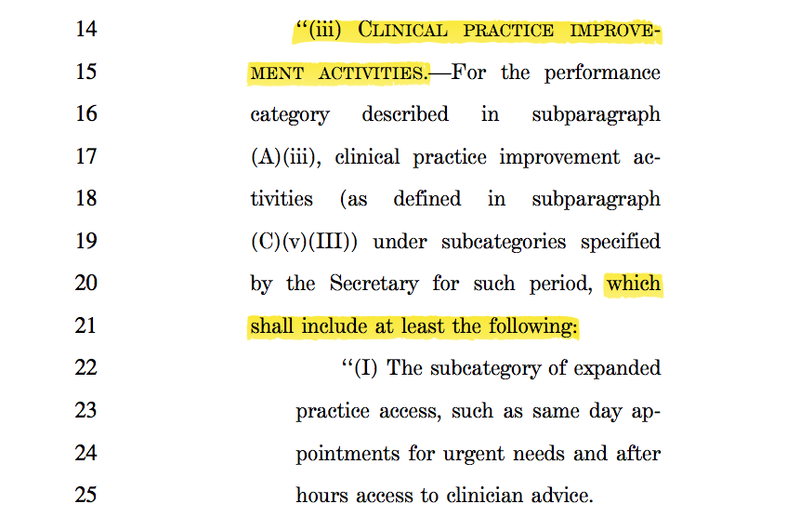 For those skeptical that the ABMS MOC Program is in H.R.2, I have included a few highlighted examples: Page 27 and 28, Page 35, and page 51 as a few examples. 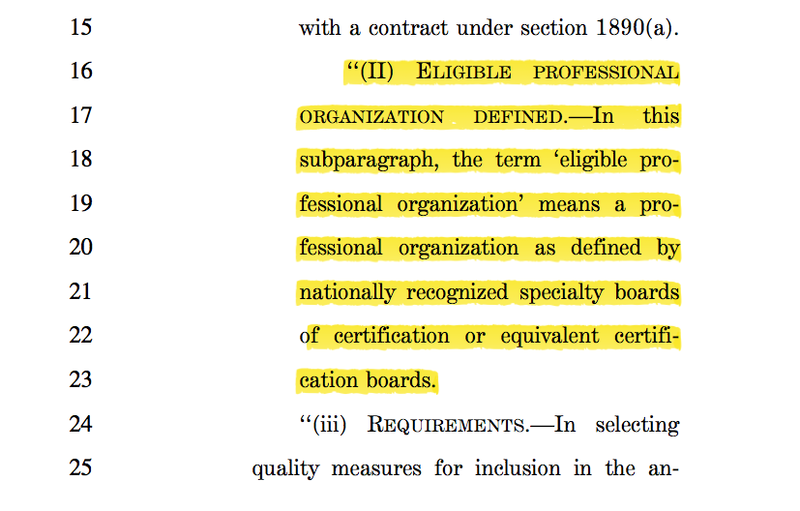 Note that HR 2 modifies portions of Social Security Law 1848 that specifies how physicians are paid. Section (k)(4) of 1848 authorizes the American Board of Medical Specialties MOC program to be a medical registry for reporting quality data. 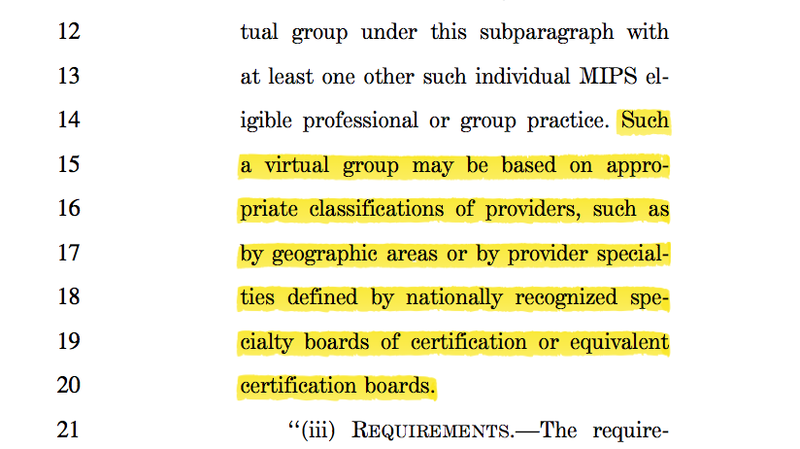 No section of H.R.2 deletes this section and only solidifies MOC as a quality reporting registry. There is nothing that has unified U.S. physicians more than their distain for the American Board of Medical Specialties' (ABMS) unproven Maintenance of Certification (MOC) program. Unfortunately, portions of this program will be used as a physician reporting measure for the new "Doc Fix" legislation coming up for a vote before the Senate on Monday. Furthermore, the National Quality Forum, headed by the former director of the ABIM, Christine Cassel, MD, stands to receive $90 million to develop even more quality measures if this legislation is enacted (Section 207). If there was ever a time to contact your Senator to voice your opinion on MOC, the time is now. Unfortunately, most doctors have never contacted a senator, or they don't have time to research all of the nuances of an issue to sound like they know what they're talking about. As a result, most doctors shrug their shoulders because they feel there's nothing that can be done since the powerful special interests control Congress anyway. But just as likely, Senators realize the foot soldiers on the ground who actually deliver care might just be an important voice if legislation is to work as it is intended. Senators are not deep in the weeds in health care and have physician lobbyists bending their ear, but not working physicians. It is up to us to educate THEM about what bothers working physicians, but we must act quickly. You can find the contact information of your senators here. To save time, here is a letter that you can download to add your name, contact information, and state of practice that does the heavy lifting for you. (You can get a Microsoft Word copy of it by clicking here). Read it. Fill in the blanks, and if it articulates your concerns about using portions of the ABIM/ABMS MOC requirements as physician reporting measures in the new bill, then send it to both of your state senators TODAY. Thank you. I have no idea if this will make a difference, but at least we can say we tried. PS: Be sure to forward this blog post to your colleagues! PPS: If you want a more politically correct letter to send that addresses additional issues, consider this one instead. What I found suggests that the primary reason ABIM attempted to expand its recertification process—which set off the uprising—is that the organization has been crippled by accounting games and needs a lot more revenue, fast, to avoid a fiscal train wreck. I also found misleading or false statements in government filings, attempts to withhold public information, damage inflicted on federal science programs and more. ABIM now even appears to be trying to trick Congress into passing laws that would force doctors to cough up cash to cover the organization’s financial follies. It even benefited from something slipped into Obamacare that seems to have been written by ABIM or its lobbyists. Methinks that both the ABIM and the American Board of Medical Specialties (ABMS) have plenty of explaining to do. Sure sounds like a lucrative kickback scheme to me. My initial story behind the MOC controversy. The latest update on the magnitude of the controversy. Which non-profit medical society pays themselves the most from MOC? On February 3, 2015, in response to overwhelming physician pushback regarding the Maintenance of Certification program sanctioned by the American Board of Medical Specialties (ABMS), the American Board of Internal Medicine suspended the Practice Improvement Modules contained in Part IV of their MOC program for two years. What physicians failed to realize, however, is the minutes required to complete the busywork inherent to "Practice Improvement" exercises were being officially rolled over to the the new "Doc Fix legislation" before Congress (see page 28, line 24 and pages 32-39 of the bill) and robbed from direct patient care as a result. It is difficult to ascertain if the ABIM leadership knew about the new 263-page doctor payment reform bill when they made their placating announcement, or if the inclusion of these wasteful and inherently meaningless practice improvement exercises is just more insurance industry hogwash permitted by the bill's clueless authors. 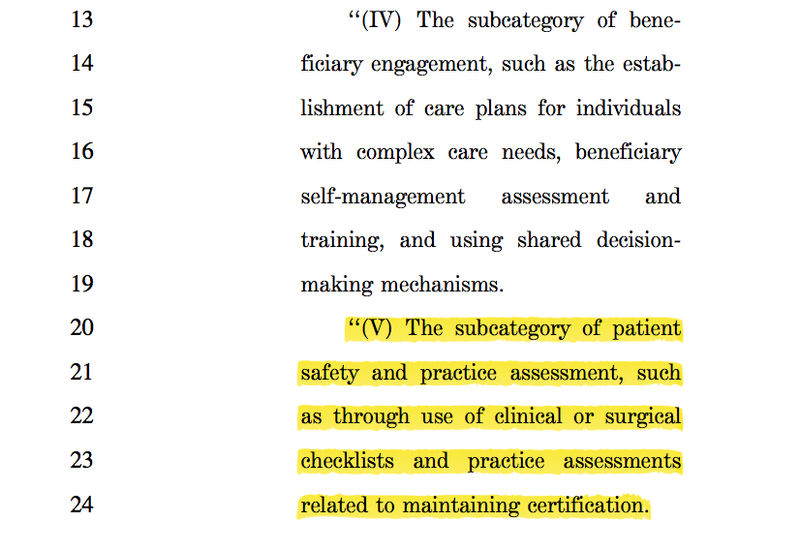 But the fact that the bill includes references to quality measures created by "consensus-based entities" like the troubled National Quality Forum and references to "maintenance of certification" should be very concerning to every working US physician. This "doc fix" bill will officially make MOC an expensive and mandatory pay-to-play scheme, formally sanctioned by our very own government. Doctors need to voice opposition to the "Doc Fix" bill now by calling your Senators. Otherwise, the "fix" will be in for working doctors everywhere.